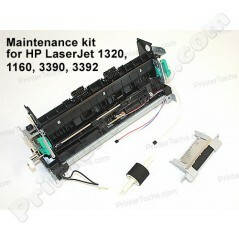 HP LaserJet 1320 series maintenance kit with a PrinterTechs compatible fuser, and genuine HP pickup roller and separation pad. HP LaserJet 1320 series instructions for replacing the fuser and maintenance kit -- check out our installation instructions. **Please note that installing this maintenance kit is considered an advanced maintenance procedure--it is ideal for users who are already very comfortable with assembly/disassembly of parts. Allow 1-2 hours for installation.